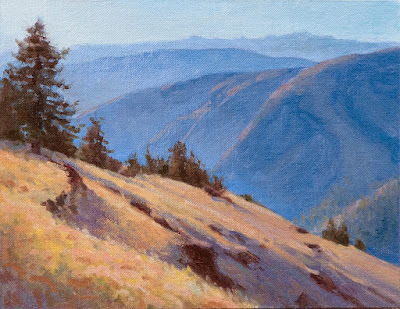 A small study painted near the Buckhorn area, on the Imnaha Canyon rim in the Hells Canyon Wilderness. The silence in a location like this is amazing, only the sounds of mountain bluebirds, a few crickets and bumblebees. The stars are dazzling with the total lack of light contamination. It seems little changed from the days when the Nez Perce roamed the area. Sightings: elk, bluebirds, a jackrabbit and a coyote pup. 6x4", Oil on Linen.